Heat oven to 350°F. Grease two 8x4-inch loaf pans with shortening; sprinkle with flour. In large bowl, beat cake mix, water, eggs, 1/2 cup peanut butter and the butter with electric mixer on low 30 speed seconds, then on medium speed 2 minutes, scraping bowl. Remove 1/2 cup of the batter to medium bowl; stir in 1/2 cup chocolate syrup to make chocolate fudge batter. Spread half of the peanut butter batter evenly in loaf pans (one-fourth of batter in each pan). Spoon chocolate fudge batter onto center of peanut butter batter in pans. Spoon and spread remaining peanut butter batter evenly over pans. Swirl with knife in circular motion. Bake 50 to 55 minutes or until toothpick inserted in center of each loaf comes out clean. Cool 10 minutes in pans. Carefully turn pans upside down onto cooling rack to remove cakes. Cool 1 hour. In medium bowl, beat 3 tablespoons peanut butter and 2 tablespoons milk with whisk until smooth. Add powdered sugar; mix until smooth. If necessary, gradually add additional 1 tablespoon milk until glaze is desired consistency. Divide glaze between 2 small bowls. In 1 bowl, stir in 2 tablespoons chocolate syrup until well blended. 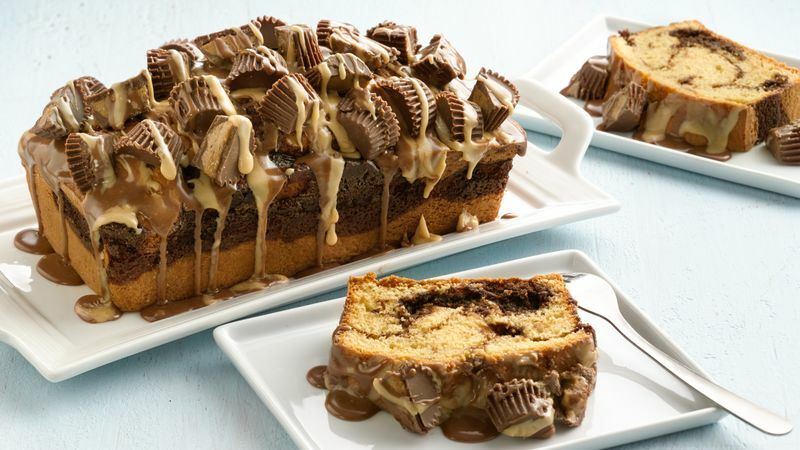 Drizzle peanut butter and chocolate glazes over cakes; sprinkle peanut butter cups over tops of cakes. This recipe makes 2 loaves of chocolate-peanut butter goodness; 1 for you and 1 for a friend. This makes a delicious gift for the peanut butter lover in your life. To make this cake in a 13 x 9-inch pan, grease and flour pan as directed, then bake at 350°F for 32-35 minutes, or until toothpick inserted in center of each loaf comes out clean. Cool in pan for at least 2 hours, then frost and decorate as directed in step 5.